Over the next few weeks, we’re taking a look at some home maintenance jobs that are perfect for the hot summer months. This week we’re focusing on how to clean the driveways and walkways outside of your home. Whilst it may be tempting to try and use a good old fashioned hose and brush, the results you’ll get will be far less impressive than if you were to use the right equipment. In just a fraction of the time, a pressure washer gets the job done and can leave the outside of your home looking brand new. First and foremost the efficiency of a pressure washer is far greater than other hand washing methods. One of the most powerful tools for removing dirt and grime from almost any solid surface, pressure washers are widely used from industrial to domestic cleaning projects. Not only are pressure washers efficient, but the level of cleaning they provide is far superior to other methods. The high-pressure jet of water strips away layers of dirt that are nearly impossible to get off by hand. Caution: Pressure washers should not be used on surfaces that are loose or have fractures in them, as this can cause permanent damage. For any weeds poking through your driveway simply pull them out at the root. Leave applying any weed killer until after you’ve completed the wash as this will be cleaned also, meaning you’ll need to repeat the process. Now that you have completed the initial prep, pour some detergent into your pressure washers soap tank. If the model your using doesn’t have a direct entry for soap, you can apply the detergent directly on your pathway, but make sure to work it in with a stiff broom prior to washing. Once the area is covered with soap, leave the detergent to soak for around five minutes. This will allow for the dirt and grime to break down. Now it is time to blast the dirt away! Starting above the runoff area, define a workable space to clean first. Once done, begin to work your way in gentle sweeps around your walkways and driveways. Try wherever you can to wash away from buildings, cars and neighbouring properties. After blasting at high pressure, there may be detergent residue left over. To prevent any soap stains, rinse the ground and a low-level setting. This allows the soapy water to run down off your drive/walkway. Finally, use your stiff broom to push away any leftover debris or standing water and there you have it. The difference in the colour of your pavement may be surprising! 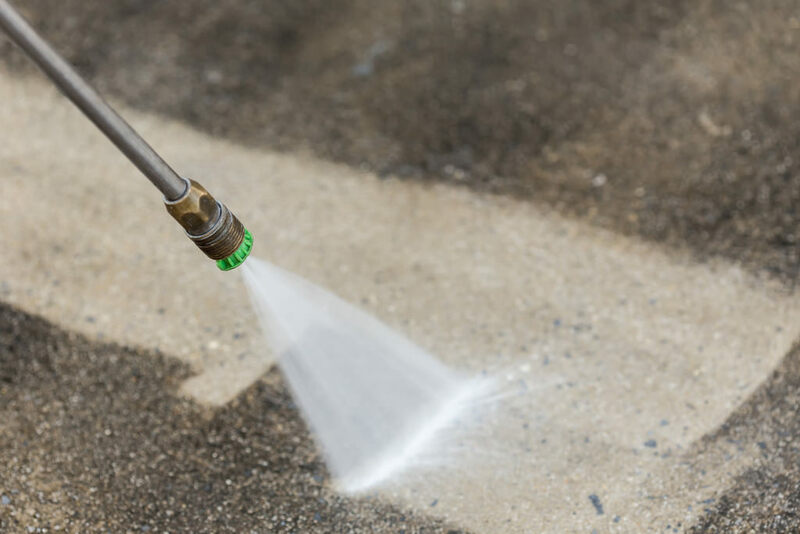 Be extra cautious when pressure washing sand lined paving, avoid the gaps wherever possible as you could loosen large areas by blasting the sand out. For this type of paving, we would recommend using the lowest pressure setting, in short bursts on each individual brick. Always remember to clear any area you intend to wash off any debris, as even a single stone can become a dangerous projectile. If you would like to find out more information about our hiring a pressure washer please feel free to contact us or visit one of our stores. We’d love to hear from you! If you’d like to read about more summer home care jobs, take a look at our guide on caring for your garden in the summer heat.